Hi, I’m Taylor Sanchez. Three years of hard work have paid off and I’m honored to be serving as your 2018 Routt County Fair Queen. I was born and raised in Routt County where I call the little town of Phippsburg home. I am 18 years old and attend Soroco High School where I play volleyball, basketball, run track, and am an active member of the National Honor Society and the FFA chapter. Upon graduation, I plan to head off to college to study nursing. I also raise and show goats for 4-H, and enjoy riding my horses. Between sports, my animals, and promoting my county fair, I don’t have much free time, but, when I can find some, I enjoy going for a ride on my dirt bike, curling up with a good book, or spending quality time with my family and friends. Come join us August 10th-19th for the 104th annual Routt County Fair. You won’t want to miss it. See ya there! Hello! 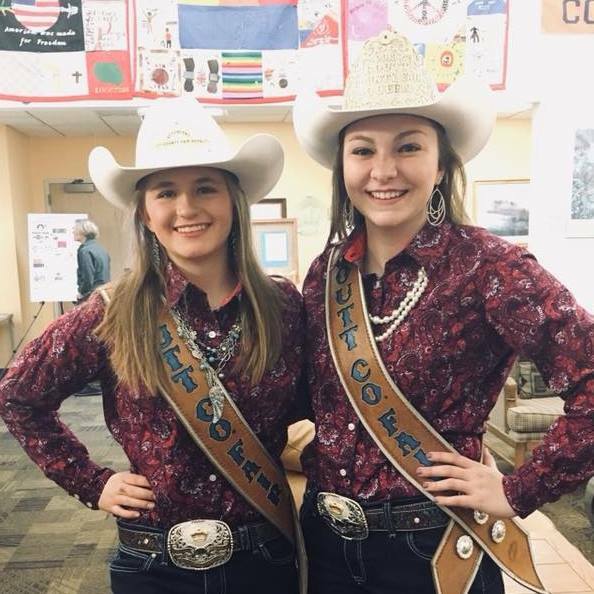 My name is Camryn Dines and I am the 2018 Routt County Fair Royalty Attendant. I currently attend North Routt Community Charter School as an 8th grader. I am also in 4-H and my favorite projects are horse and the beef project. I enjoy riding my horses and playing basketball on my free time. I would also like to give a huge thanks to my parents and everyone else that has help me get to where I am today. I’ll see you at the 104th Annual Routt County Fair, August 10th -19th, 2018 in Hayden, CO!